Who was Sven Hedin? A Swedish explorer and geographer known for his expeditions to Central Asia, Dr. Sven Hedin created detailed maps in areas including Tibet, Turkestan, and northwest China. He is probably best known for his rediscovery of the buried Silk Road settlement of Khotan in 1896. By 1910, Hedin had made acquaintance with fellow Swede Carl Milles and they became lifelong friends. 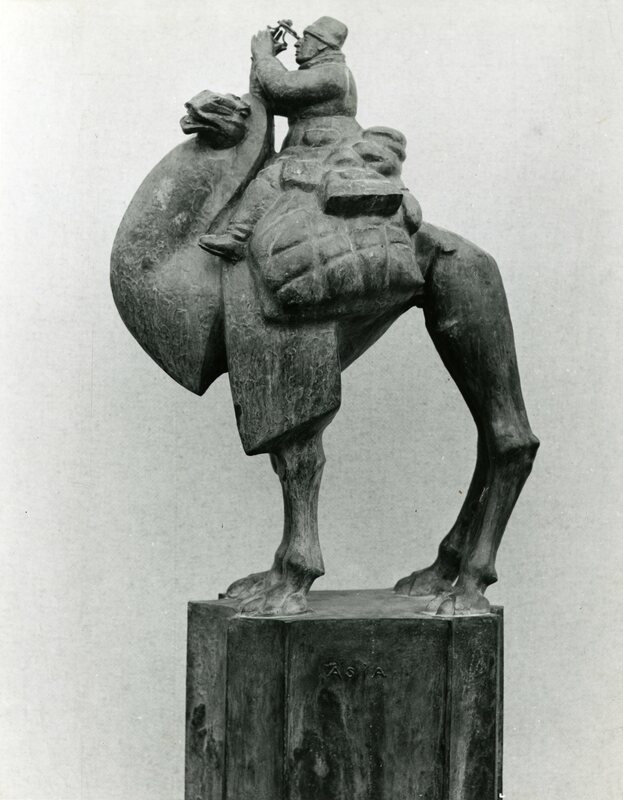 Milles, who always admired Hedin, created a sculpture in 1932 to honor his friend. 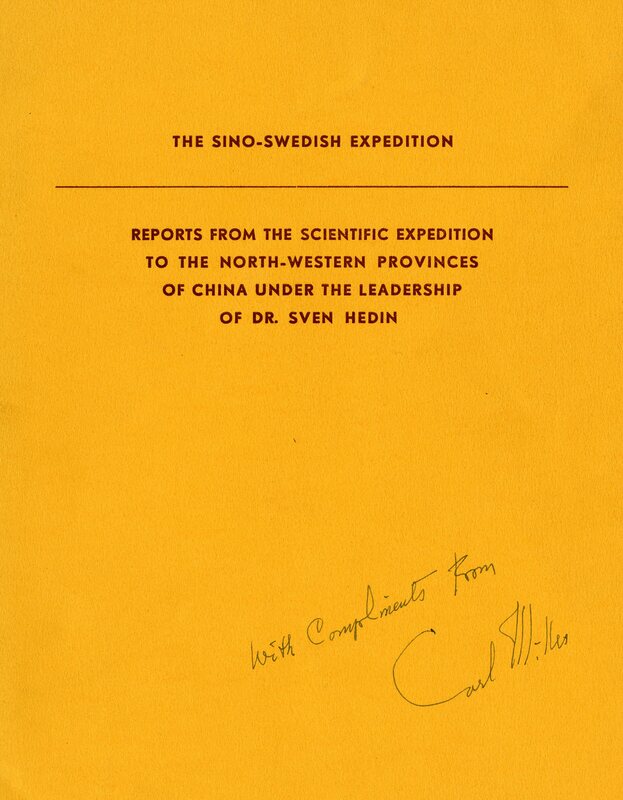 From 1927-1935, Hedin organized the Sino-Swedish Expedition (watch the video) during which he investigated the archaeological, geographical, and topographic features in Inner Mongolia, the Gobi Desert, and Xinjiang, China. He spent the remainder of his life occupied with a publication dedicated to his findings. Needless to say, Hedin returned to Cranbrook, a little worse for wear – quite scratched and missing his telescope. The sculpture was ultimately shipped to Sweden for restoration. Upon its return, noted explorer Sven Hedin was once again mounted on his pedestal where he remains today. Lake|Flato Architects of San Antonio, Texas designed the Cranbrook Kingswood Middle School for Girls in 2011. Like other buildings on Cranbrook’s campus, Lake|Flato designed niches along the main hallway for the display of art. I’ve had the pleasure of helping incorporate art pieces into the building; we always try to add works that enhance the material palette of the building–green glazed brick, Kasota limestone, brown cast-stone block, copper, and light maple. Philosopher Chimpanzee displayed on a custom mount in a niche at the Cranbrook Kingswood Middle School for Girls. This summer, the Center for Collections and Research along with Capital Projects installed a work from the Cultural Properties Collection in one of the niches: Philosopher Chimpanzee, by former Kingswood School Cranbrook Sculpture Instructor Marshall M. Fredericks. Philosopher Chimpanzee is a bronze high-relief of a monkey in a thoughtful pose with a smaller monkey in the background. There is a green patina on the bronze. The Philosopher Chimpanzee was done as a part of a series of twelve reliefs by Fredericks. He designed the series for a competition in 1939, hoping they would be installed on a government building in Washington DC, but the building was never built. The donor of the work, June Lockhart, was a 1938 graduate of Kingswood School Cranbrook. While at Kingswood, her sculpture teacher was Fredericks. Lockhart’s father, Robert H. Daisley, was the Vice President of Eaton Manufacturing Company. He commissioned Fredericks to create a memorial in honor of the employees of the Eaton Manufacturing plant in Saginaw who died in World War II. Daisley bought the Philosopher Chimpanzee at that time, which Lockhart inherited upon her father’s death. She generously gave it to Cranbrook last year, and we are excited for the girls to see it when they return for classes this fall! The chimp joins the other Marshall Fredericks works on campus, including The Thinker at the Academy (another philosophizing primate), The Pony Express reliefs at the Boys Middle School, and the Two Sisters at Kingswood. * Fun Fact: One of Leslie’s hobbies is giving tours of Greenwood Cemetery in Birmingham, Michigan, where Marshall M. Fredericks, as well as the Booth family, are buried.